Reference number for this case: Oct-54-Vic-sur-Sère. Thank you for including this reference number in any correspondence with me regarding this case. The "flying saucers" continue to travel the sky. Some land and their occupants are trying to get to know the human... Thus Mr. Angelo Girardeau, residing in Breuil-Chaussée (Deux-Sèvres), stated to have seen yesterday morning a circular machine near which was a being who appeared dressed him in a sort of spacesuit. The being in question headed Mr. Girardeau who, frightened, fled. Soon after, the circular craft returned at high speed. Two young men of Vron (Somme), say they too have seen on the road between Crécy and Ligescourt a curious craft prowled around which individuals oddly shaped. They approached the craft which, they say, like a wheel, but he took off. The two young men have told their adventure to the gendarmes. In Vic-sur-Cere, several people claimed to have seen, heading south, a machine having the shape of a cigar and giving off a slight plume of smoke. In the Nièvre, a representative of an insurance company of Clamecy and Corbigny several residents reported seeing a bright orange disc which after repeatedly changed altitude, disappeared vertically. A resident of Bourg-du-Cerisier, in the Indre, Mrs. Janiki, told police she had seen flying at roof height of a building, a luminous machine with a diameter of 3 meters. Ms. Lacotte, who lives 800 meters from Ms. Janiki, said he noticed the phenomenon. "In Vic-sur-Sère, an apparatus in the shape of cigar releasing a light plume of smoke was observed. At the time of its passage, ultrasonic phenomena [?] and a case of "exploding windshield" is said to have been recorded." The two authors allot this phenomenon to the passing of a jet airplane. They add that it is only in UFO files that such a case is not allotted to a jet airplane but to a flying saucer. Once again, Barthel and Brucker use one of the good old easy "debunking" trick. Indeed, I actually did not find this case anywhere in the ufologic litterature. I did not find any author making even a mention of it. It is Barthel and Brucker who, again, are apparently the only ones to "put it on record" for then claiming that "UFOS files" - plural - contain cases easy to explain by commonplace causes. Although "UFO files" are of various quality and indeed contain cases for which an ordinary explanation was not seen by the managers of the file, the trick used here by Barthel and Brucker tells a lot about the intellectual honesty of their approach. Moreover, their explanation of this case is open to discussion since a large meteorite could just as easily explain it, while a jet would more probably have been identified as such at the time. [nl1] Article in the foreign newspaper La Nouvelle Revue de Lausanne, Lausanne, Switzerland, October 5, 1954. 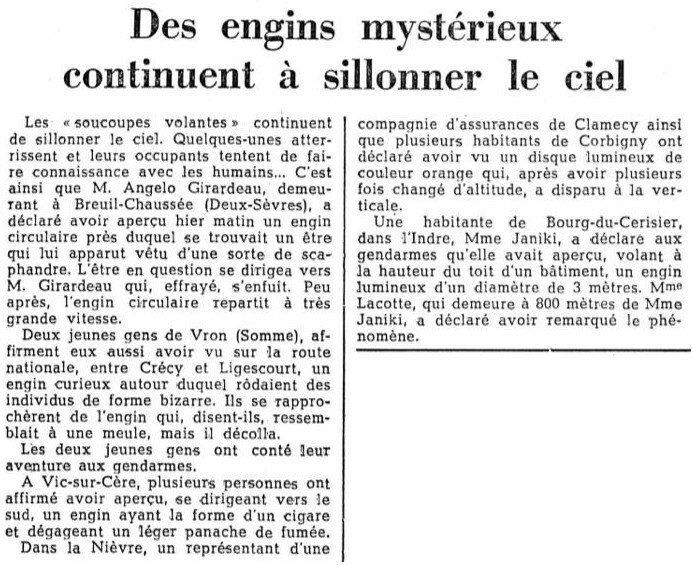 [---] Article in the newspaper La Montagne, Aurillac edition, Celrmont-Ferrand, France, October 6, 1954. [bb1] "La Grande Peur Martienne", book by Gerard Barthel and Jacques Brucker, Les Nouvelles Editions Rationalistes publishers, pp 178-179, 1979. 1.1 Patrick Gross October 29, 2016 Addition [ln1]. 1.2 Patrick Gross December 26, 2016 Addition [ub1]. This page was last updated on December 26, 2016.